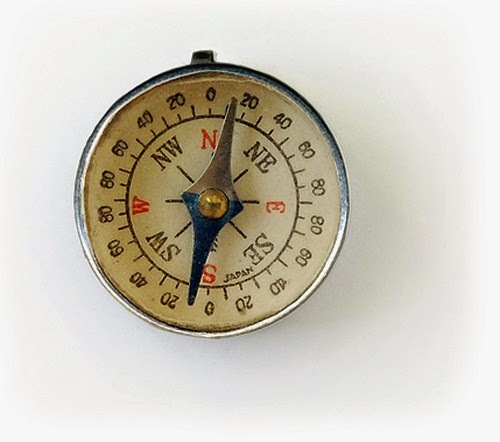 Purpose is true north that never varies. A lot of companies give lip service to "purpose" nowadays. I get tired of attending conferences and reading articles where business "purpose" is equated to Corporate Social Responsibility (CSR) initiatives, as if purpose is something a firms buys and plugs into a small corner of the organization with the goal of generating PR and purchasing goodwill. USAA is widely recognized as a firm that leads with purpose, and it is a purpose that is earned primarily with sweat and focus, not just dollars and charitable donations. What "purpose" really means at USAA was demonstrated by a recent announcement from President Obama about the Veterans Administration. Joe Robles Jr., who just retired as CEO of USAA, was named the chair of a new committee to assist the struggling VA. The goal of this group is to provide short-term and long-range priorities to improve VA operations and services. In the history of thankless tasks, this may rank near the top. At an age when most take on the challenge of improving their golf handicap, Robles is dedicating himself to improving one of the largest bureaucracies in the world. In the 20 years Robles served as USAA's CFO and CEO, he personally demonstrated what purpose really is, never missing an opportunity to remind employees and leaders of the association's mission: To facilitate the financial security of those who serve their country and their families. He personally gave his time to organizations that helped active service members and veterans, and in his role as leader, he constantly demonstrated USAA's purpose by promoting measures of how the organization achieved its mission above and before measures of how the organization achieved financial success. As with many companies that lead with purpose, USAA has no difficulties achieving the latter because of its commitment to the former. After serving his country for 28 years in the U.S. Army and then being employed at USAA another 21 years, you might think that Robles has done his duty assisting the military community. But just one month after retiring from USAA, he is again putting himself in a position to improve the lives of veterans and their families. Of course, Robles is not the only leader to demonstrate that purpose never retires. Jimmy Carter remained active in international and domestic affairs long after he left office, traveling the world to conduct peace negotiations, observe elections, and advance disease prevention and eradication in developing nations. And former CEOs as diverse as Bill Gates and Herman Cain have used their fortunes and political clout to advance their causes and world views. But so powerful is Joe Robles' purpose that three years after leaving the employ of USAA, I still am inspired by the strength of his purpose. He demonstrates that purpose is not a strategy or PR tactic; it doesn't come from focus groups and research; and it is not CSR. Robles' sense of purpose resonates so strongly because he demonstrates that purpose is something you are and do; something that drives you to continue when no one would blame you for stopping. For Joe Robles, purpose never retires. Even after leaving USAA, his sense of purpose continues to serve as an example for USAA employees (both current and former) and for other corporate leaders. This week is the annual SXSW Interactive conference, where social media elite descend on Austin to party on Sixth Street, post selfies with people who have higher Klout scores and pick up the mad schwag liberally distributed by startups. A few may even wander into conference halls to see some presentations, although that is far from certain. This will be my third year staying home, and while I will miss the chats and parties, I will not miss the general sense that SXSW is a missed opportunity for the social media industry. All the best and most experienced minds in the business gather in one spot, but few find themselves in sane, sober and expansive conversations because it is hard to focus on serious topics when one is screaming over an indie band or dashing from the Convention Center to South Commerce to West 6th for events. Although SXSW Interactive has tended to feature more hype than criticism, perhaps 2015 will be the year when reality sets in. At last fall's Social Shake-Up, I was pleasantly surprised at the candor at which people were discussing declining reach, difficult social metrics and social media marketing obstacles. It will be interesting to see whether the predominant buzz from this year's SXSW is about social media marketing difficulties or the more typical chatter about the next hot new app. 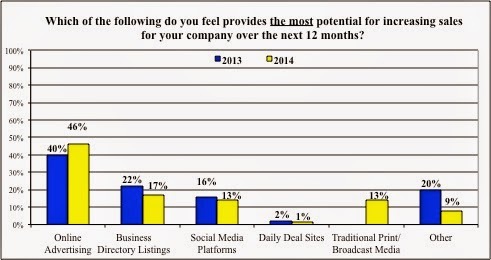 The Center for Marketing Research at the University of Massachusetts Dartmouth finds fewer companies optimistic about tracking sales through social media: In interviews with executives at Inc. 500 firms, the UMASS study found a drop in companies tracking sales through social media, from 36% in 2013 to 32% in 2014. Even more telling, at a time when marketers are spending more on social media and should be improving their metrics, the number of executives who do not know if social is driving sales increased seven points, from 11% to 18% (and another 44% believe it accounts for less than one percent of sales). 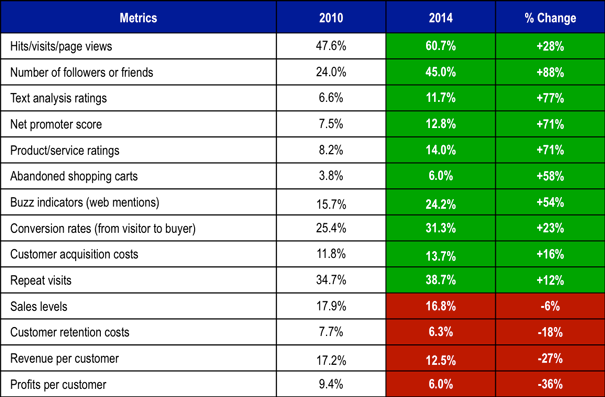 The CMO Survey finds that marketers continue to use the least powerful social media metrics: It is amazing that the two most common social media metrics used by marketers this far into the social era are still Hits/Visits/Page Views and Number of Followers or Friends. We are well past thinking that top-of-the funnel metrics are a good way to measure any digital marketing tactic, much less social media. Less than a third of marketers evaluate social media based on conversion rates, and fewer than one in seven use customer acquisition cost. 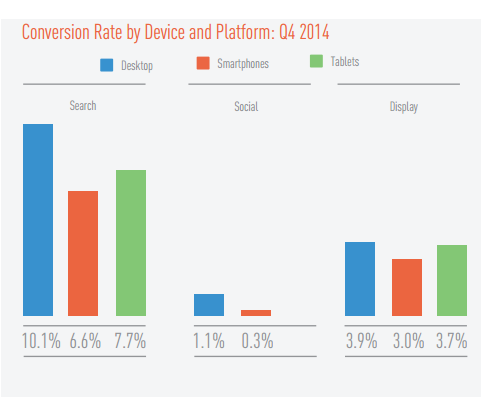 Marin Software finds social advertising significantly lags search and display: The Marin Software Performance Marketer's Benchmark Report is expansive, covering over $6 billion worth of ad spend from advertisers and agencies with budgets in excess of $1 million annually on paid-search, display, social, and mobile. First the good news for social media: The clickthrough rate for social ads is better than for display ads--social CTR was double that of banners on desktop and 50% greater on smartphones. However, while social ad clickthrough may beat display, it still pales in comparison to search, which has a 425% better CTR on desktop and 383% greater on smartphones. Once the folks who click on those ads arrive on your site, social conversion rates are downright dismal. Compared to social ads, display advertising's conversion rates are 255% greater on mobile and 900% more on smartphones. Social advertising conversions fare even worse against search ads; search ads deliver conversion rates 818% higher on desktops and 2100% greater on smartphones versus social ads. Will data like this get attention, discussion and consideration at SXSW, or will this year's conference continue its history of celebrating consumer adoption and the rare but unrepeatable successful case study? If SXSW attendees buzz about the growth of "dark social" and Audi's Super Bowl Snapchat success rather than explore what we have learned from our experience on the social networks that have been around for eight years, then we will simply see brands repeat the same mistakes on Snapchat, LINE and WhatsApp that they made on Facebook and Twitter. For those attending SXSW Interactive, my wish is that you have more challenging, sober and enlightening discussions than you do drinks and that you leave Austin with more hard data than promo items. It is no secret among Customer Experience (CX) professionals that most CX efforts fall flat. Forrester found that only 25% of CX professionals say their companies’ CX programs actually improve customer experience, and Avaya recently published a study indicating that 81% of organizations have seen their Customer Experience Management (CXM) initiatives fail in the last three years. The problem is that most companies view Customer Experience as a program and not a purpose--something to be assigned to a couple of employees while the rest of the company goes about its business improving efficiency, acquisition and margins. 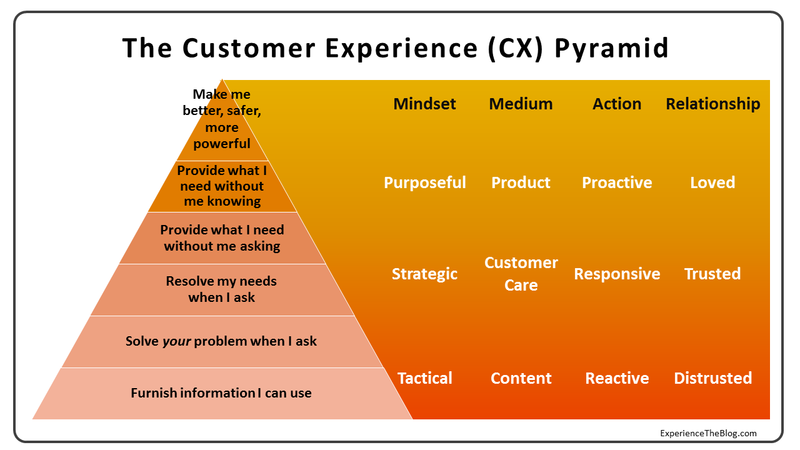 When one considers the hierarchy of experiences brands can furnish customers to satisfy their needs--"The CX Pyramid"--it is easy to understand why so many CX efforts fall short. Most of today's CX initiatives focus on incremental change in existing processes, which limits those programs to solving the least important needs at the bottom of the pyramid. Finding CX gaps and fixing them with more content on websites, new training for customer service representatives or greater self-service options certainly offers benefits, but nowadays these actions are table stakes rather than ones that allow brands to differentiate themselves from the competition. Today's innovative companies begin their Customer Experience design in a different place--not with customer perception of existing products and services but with an understanding of consumers' evolving needs and expectations. As we will see, the most powerful companies today simply rewrite the Customer Experience from the top of the pyramid down, leapfrogging established competitors by delivering experiences that are more integrated, robust and powerful. 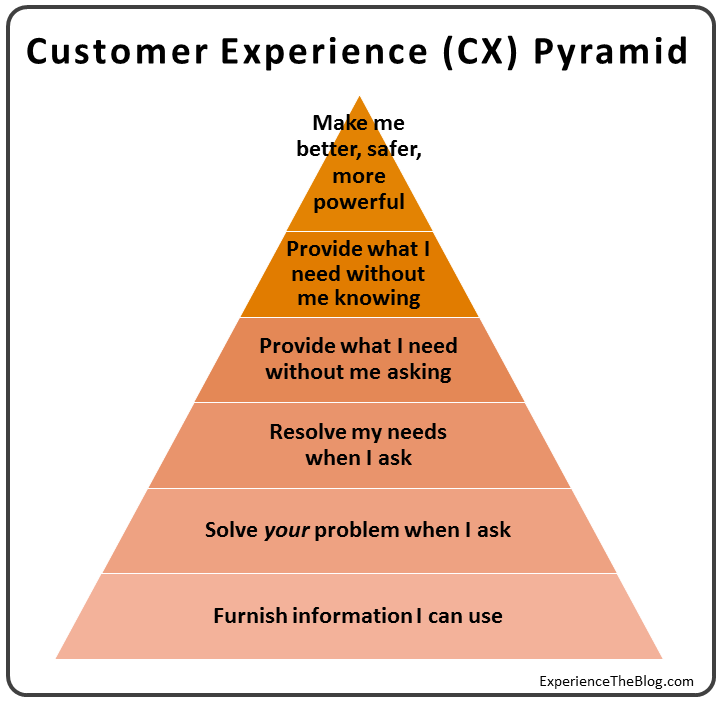 Furnish information I can use: The lowest form of CX is to give customers information so they can solve their own problems. If I suffer a flat tire, a brand may offer instructions on how to swap it for the spare. Or if I have my identity stolen, a company may provide the twenty steps I can take to recover. This sort of information is good to know, but it is a weak customer experience that does little to satisfy customers or create differentiation for brands. Solve your problem when I ask: Let's face it, most customer care nowadays is designed not to satisfy my needs but to solve the company's issue--namely to get me off the phone or stop me from complaining on Twitter as quickly as possible. Even worse, companies like Comcast are turning their customer care employees into sales representatives, holding them responsible for quotas of new revenue-generating services and for retaining customers who simply wish to cancel. This sort of experience tells customers their needs are less important than the company's. Resolve my needs when I ask: There is a difference between handling a customer's immediate issue and resolving their needs. If a repair service replaces my flat tire with a spare but I still have to get the damaged tire repaired, my needs have not been fully resolved. Or if my bank puts a hold on my checking account after my identity has been stolen but I still have to call the credit card company to cancel my card, the bank has not resolved all my needs. To fully satisfy customers' needs and not just process their requests takes time and care, but it furnishes a more powerful brand experience. Provide what I need without me asking: Not every company or service can do this, but providing what a customer needs before they ask is a powerful way to demonstrate customer commitment and win loyalty. When your credit card company catches fraud before you do, alerts you and has a replacement card in the mail before you even ask, that is a memorable experience. Or consider our tire example--would some be willing to pay more for a service that removes all worries by monitoring their tires, knowing when a flat is about to occur and replacing it overnight in the customers' driveway? Providing experiences that protect customers from harm or help them to exploit opportunities before they ask furnishes brands with strong, trusting and emotional customer bonds. 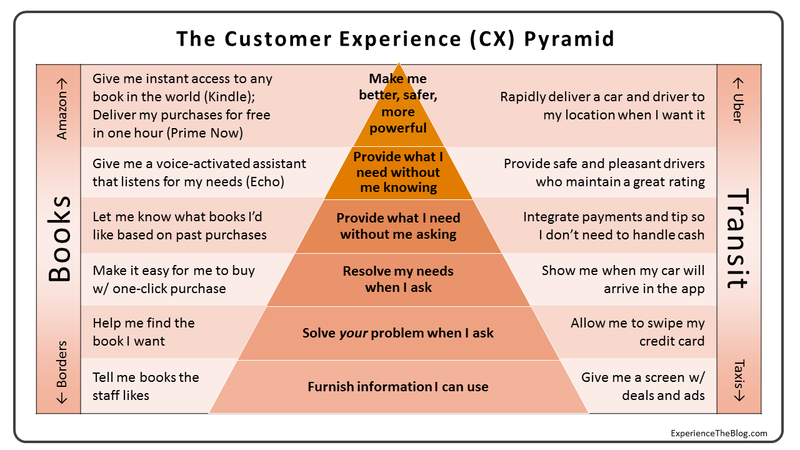 Provide what I need without me knowing: As we near the top of the CX Pyramid, we arrive at levels of experience that can only be provided when brands rethink products in the age of big data, mobile connectivity, social media and the Internet of Things. Nest thermostats offer an Auto-Away feature that raises and lowers my home's temperature, saving me money without me even knowing it is acting on my behalf. OnStar Automatic Crash Response can estimate the severity of a car accident and alert authorities, even if I cannot. Google Now monitors my activity and furnishes updates I may need but did not request, such as the delivery status of a package (automatically derived from an email confirmation I received) or the directions to a business (for which I recently searched). The future of CX isn't merely reactive and responsive but proactive and serendipitous, which means the brands that will win our trust, loyalty and advocacy will solve problems or harness opportunities we do not even know we have. Make me better, safer, more powerful: Much like Maslow's hierarchy, this self-actualizing (or brand-actualizing) level is more aspiration than reality in most verticals, but there are plenty of examples to be found among the world's most powerful brands. Apple achieved this with the iPhone and iPad, giving consumers devices that allowed them greater access and control of information and communication in a more intuitive fashion than was previously imaginable. Facebook, Twitter, Snapchat and others have given people incredible power to broadcast information, build reputation and enhance relationships. And the rapid growth and adoption of collaborative economy companies such as Uber, Airbnb, LendingClub, Kickstarter and others is due to the way these innovative startups furnish consumers with more power--over assets, expenses, income and experiences--than traditional providers and business models can match. Backwards-looking: Many CX programs strive to identify and patch problems in the existing product and service environment rather than seeking ways to significantly change that environment. Reactive: CX initiatives often implement ways to improve the experience for customers who hold up their hands and ask for help rather than seeking ways to furnish experiences that proactively prevent issues or furnish solutions. Tactical: Many CX programs have the ability to change tactics rather than being empowered to rethink the organization's strategic approach to meeting customers' most important and ever-changing needs. Narrow: While there's nothing wrong with housing the CX team within the Marketing or Customer Care departments (which four in ten organizations do), the impact is reduced when these programs only influence change within those silos rather than encouraging (or requiring) collaboration across departments. Self-interested: Companies that put the customer first and evaluate CX in terms of customer perception will have stronger outcomes than those that seek to change CX only in ways that improve corporate financial outcomes. Companies that make profound leaps forward in Customer Experience are the opposite. Brands like Amazon, Apple, Nest, Uber, Zappos, USAA, Square and Costco have CX efforts that are forward-looking, proactive, strategic, broad and customer-centric. Their results are realized not in incremental improvements to customer care or existing products but with profoundly different experiences that satisfy a higher order of customer needs. Compare the CX approaches taken by Amazon and Borders. Whereas Borders' CXM process sought to make the existing bookstore experience more pleasant with cafes, Amazon's approach to CX was to start fresh and focus at the top of the CX pyramid. While Borders was achieving the top-rated CX in the country, Amazon was re-imagining the Customer Experience of shopping in a digital world. And when Borders went bankrupt, Amazon was still rising, collecting more customers and building stronger relationships. How could the company with the top-rated CX in the country fail, beaten by the upstart Amazon? The differences in Amazon's and Borders' outcomes can be seen when comparing how their CX improvements fit into the pyramid. While Borders offered shelves of its employees' favorite books ("Furnish information I can use," the bottom rung of the CX Pyramid), Amazon offered a recommendation engine to provide personalized selections for its customers ("Provide what I need without me asking,") While Borders offered cafes (a move that had more to do with solving its own problem of increasing share of wallet than with satisfying consumers' demand for still more coffee shops in the world), Amazon was launching the Kindle, a device that gave consumers the power of instant access to literature and information with greater mobility. Borders optimized the customer experience for bookstores in today's business model, while Amazon envisioned new products and services to provide the customer experience of the future. As today's business models withered against digital solutions that furnished experiences higher in the CX pyramid, Borders was left with the best customer experience that no one wanted. The same can be said for Uber versus the taxi industry. Uber did not start with the existing taxi system, study consumer complaints and launch a new livery company with cleaner cabs or friendlier drivers; instead, Uber rewrote the CX of urban transportation. Compare this to the "innovations" offered by taxi companies in the past two decades, such as card readers that allowed consumers to swipe their credit card (while earning a glare or outright hostility from the driver) and video screens that did little for riders but helped the taxi companies earn revenue from advertisers. While taxi companies were largely ignoring their CX problems or providing solutions at the very bottom of the CX pyramid, Uber went from unknown startup to $40B company by starting at the top of the pyramid. Uber's mobile application, with its real-time driver location data, ratings system and integrated payment platform all provided solutions that fit into the upper portion of the pyramid. But the real killer attribute of Uber is found all the way at the top of the CX Pyramid--the ability to immediately call a taxi to my current location. Giving that power to consumers has made standing in the gutter waving at passing yellow cabs seem as hopelessly outdated as the horse and buggy. Uber's on-demand service is an example of how the Customer Experiences that really matter are ones that "Make me better, safer, more powerful." Whether one compares the top-rated and bottom-rated companies in Customer Experience, or the brands that are most rapidly lifting their brand equity versus those that are not, or the most trusted versus the most distrusted companies, it is easy to see how the brands that succeed do so by providing experiences that solve higher orders of consumer needs. The future belongs to companies that understand that CX is the most powerful force for building brands in the era of splintering media, diminishing consumer trust, empowered consumers and powerful WOM. In the future, brands will not succeed because they have CX programs. They will succeed when CX is driven from the top, is integral to company culture, guides the behavior and actions of all employees, spans silos, and ensures that products and services satisfy consumers' most important needs. Tomorrow's success stories are today focusing at the top of the pyramid, while the future Kodaks, Borders and Radio Shacks of the world are all anchored to the bottom.